Discover the beauty of the night sky! The handy pocket-sized diary packed with everything a stargazer needs to know in 2014. The diary features everything that astronomers, from adolescent beginners to more experienced observers, need to know in 2014. We included concise information on all meteor showers, conjunctions and eclipses, plus visibility of planets, double stars, clusters and nebulae. Dozens of the most beautiful astronomical objects were carefully selected, then only those visible to the naked eye or using binoculars were included in the final design. We wrote in accessible, jargon-free language. Being a diary, we also left space for the proud owner to write their own musings. We want it be a personal record of your astronomical adventures, a handy guide to write on top of. 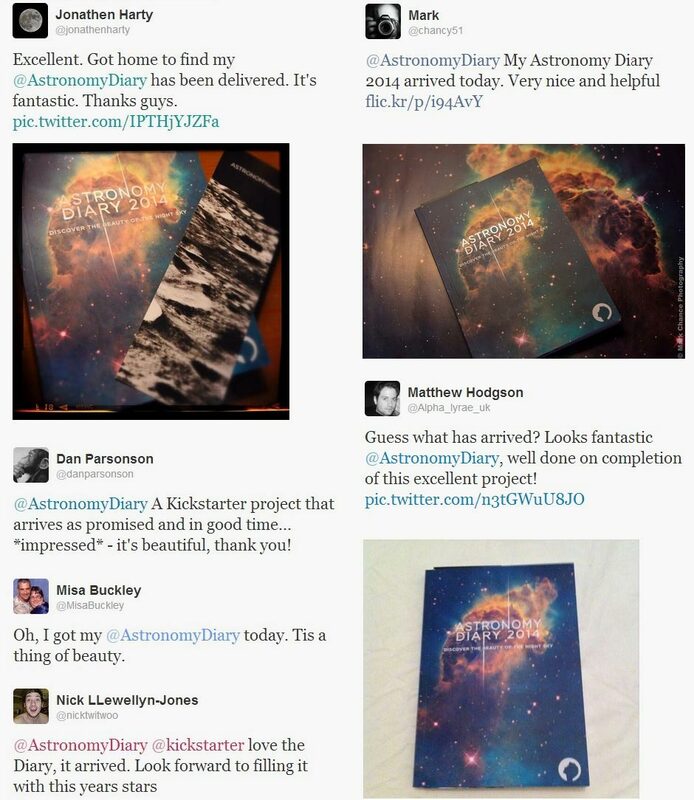 The Astronomy Diary is a handsome object to hold and carry anywhere. We took our time picking stunning illustrations and arranging each individual page to ensure a beautiful end product. With the Astronomy Diary you get to know the most beautiful astronomical objects and events visible to the naked eye. It's a fun and easy way to learn about astronomy and space exploration. Features everything astronomers, from adolescent beginners to more experienced observers, need to know in 2014. Find great weekly recommendations for observations. It is designed to be a personal record of your astronomical adventures, a handy guide to write on top of. Use it to record your plans and observations. It probably works well with shopping lists too! A pocket-sized beauty to be taken anywhere. Its A6 size means it fits in most pockets, while bendy covers ensure it sits there comfortably. Keep it on you and use it for inspiration. Pocket-sized astronomy guide featuring all must-see events for 2014. Weekly tips for "What's On" in the night sky. Includes a 52-page planner with space to write your own thoughts, plans and observation notes. For observers in the Northern Hemisphere only. Size is 170mm by 120mm when closed, which is slightly larger than standard A6. Paper is 90g monochrome for the body with full colour UV-coated soft cover. There are 66 pages that cover the 52 weeks of 2014 plus additional pages with photos and information. Know what's on. Weekly recommendations for what to observe in 2014 in the Northern Hemisphere. Get to know the most exciting celestial objects and learn about astronomy and space exploration. Fits in your pocket. This is a small but mighty diary to be taken anywhere. Its A6 size means it fits in most pockets, while bendy covers ensure it sits there comfortably. Make it personal. This is your diary. Use it to record your plans and observations. Probably works with shopping lists too. The perfect gift. Introduce a friend or relative, child or adult, to the wonders of the night sky. Our delivery dates for the UK will be within the first week of December, well in time for Christmas. Astronomy for all. 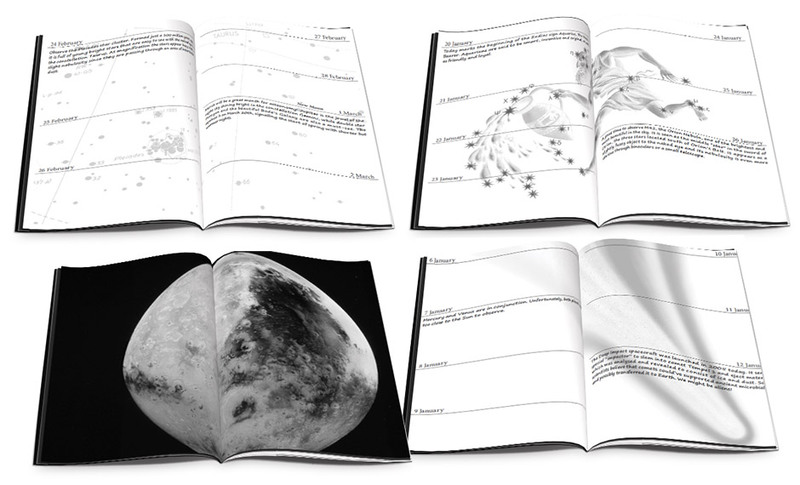 The diary features only astronomical objects that are easy to observe. It provides all the science you need in a friendly and accessible language.